Luckily I already knew what to expect when I used Myrkvidr ‘Yggdrasil’ Beard Balm as I had already tested their ‘Blood Eagle’ Balm. Again this was a very firm balm, as you can see in the photo above that was taken of the ‘Blood Eagle’, I used the tip of my metal comb to extract some balm. ‘Yggdrasil’ Beard Balm from Myrkvidr is a strong hold balm, in fact it’s the strongest balm I have ever tested. Unlike the other balms this doesn’t melt when worked between your palms and applying it takes some care. This is more gum like, almost like a strong wax, you don’t want to end up with a clump in your beard. Just spread it the best you can in your palms and slowly rub onto your beard. I say onto because it doesn’t go into the beard. If you want to keep your beard firmly held in place, then Myrkvidr balms will do that. ‘Yggdrasil’ is a Sandalwood blended with Amyris oil scented balm and it smells very nice indeed, a warm scent with a sweet rich aroma that is almost reminiscent of an Incense that I used to use. If this balm was a bit softer and easier to work into my beard, then it would be amazing because the scent is really incredible. 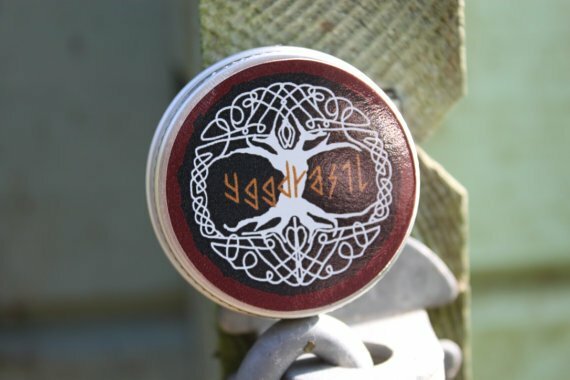 ‘Yggdrasil’ Beard Balm from Myrkvidr comes in a 15ml screw top tin and is available from their Etsy shop for£2.99 plus postage. You can keep up to date with Myrkvidr on Instagram. Edit: I have used this balm today as a moustache wax and it works really well, it was a bit hard as a balm for me but the smell is amazing. So that’s how I shall use it.